If you love dealing directly with clients and enjoy keeping up to date on the latest fashions and trends, you may want to become a personal shopping. Personal shoppers purchase merchandise on behalf of their clients, often making suggestions and selecting items based on what they believe their client would like. Personal shoppers purchase merchandise on behalf of their clients. Personal shoppers are either self-employed or work directly for a retail store, usually high end establishments. Personal shoppers that are self-employed will usually create their own base of clients, while high end establishments will offer the assistance of a personal shopper as part of their amenities. Regardless, the personal shopper is responsible for purchasing the items that the client needs. The shopper will meet with the client and the client will tell them what they want. A personal shopper is usually used when a client cannot purchase items on their own. This can be due to age, disability or simply a very busy schedule. While sometimes a personal shopper will receive a very detailed list of items, more often the specific items will be up to the personal shopper’s discretion. Personal shoppers are often called upon to advise their clients about the most recent trends, fashions and products. Personal shoppers usually work in the area of fashion but not always. The personal shopper will first meet with the client and discuss their needs. Personal shoppers that have fostered long-term relationships with their clients may meet with them regularly and learn their personal style. The client may have questions regarding current trends or may ask the personal shopper questions about the most practical items or items that hit a certain price point. Other clients may simply ask the personal shopper to get specific items, such as a certain amount of dresses, shirts or pants. Personal shoppers may exchange items on behalf of the client if they are not satisfied. The main goal of a personal shopper is to take care of the client, though some may be encouraged to sell additional products. 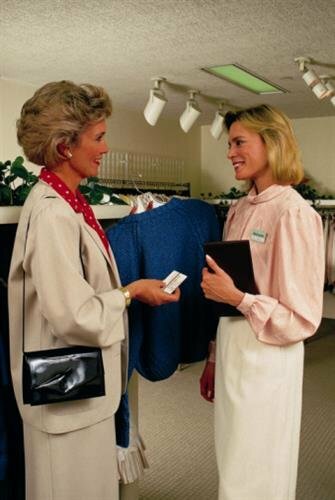 Overall, the personal shopper service is offered through retail establishments as a way of connecting to clients rather as a purely sales position. According to CNN, some personal shoppers may take their clients on shopping tours rather than shopping for them. How Do You Become a Personal Shopper? A personal shopper will usually have some background in fashion, retail or sales. Personal shoppers need to be extremely personable and able to relate to people well, and they should be able to develop intimate knowledge with a product line. Personal shoppers usually don’t require any form of formal education and they are often treated as a retail position. It can be relatively easy to break into the personal shopper field, but those that are interested in the field will need to have a specific set of attributes which includes social skills and determination. How Do You Advance as a Personal Shopper? Personal shoppers that are self-employed can advance by acquiring more clients. Those that are employed by specific retail stores can advance through promotions or by moving into high end stores and boutiques. Retail personal shoppers can also consider becoming self-employed themselves, especially if they have a strong client base. Self-employed personal shoppers need to network well and usually need to focus on fairly affluent customers. Those within retail need to focus on customer satisfaction if they want to advance within the field. Most retail stores will not judge their shoppers based on their sales, but some more revenue-oriented stores might. Personal shoppers are usually considered a type of retail sales worker according to the Bureau of Labor Statistics, and have all of the benefits traditionally afforded to retail staff members.